THIS MONTH THE SPOTLIGHT FALLS ON Brighton's 'Grand Dame'. One of De Vere's ten luxury hotels, which has undergone refurbishment, bringing a touch of the modern to this elegant Victorian icon on Brighton's famous seafront. The Grand epitomises the glamour and luxury of a by-gone era, and it was important not to lose this with the introduction of more contemporary designs. It was therefore necessary to ensure a perfect marriage of old with new, where the new only served to enhance the hotel's existing splendour. "Without wanting to take the seaside location too literally, it was impossible not to be inspired by it. All the designs have a natural element to them, from the subtle textured wave running in the background of the leafy function room carpet, to the bar design with its delicately pebble patterned boulder-like shapes which seem to undulate across the floor -- such elements are timeless which I felt worked to unite new with old and also seemed appropriate for this enduring hotel. The bedroom approach was classic and sophisticated, using small geomatics so as not to appear intrusive, and keeping the colours cool and light." We believe it is important to provide our clients with choice. The extensive product range we offer meant that Gravity was able to meet all of The Grand’s flooring needs. Gravity’s Premium range engineered oak was used in two areas, Oyster Light in the Bar and Benfleet in the restaurant. The carpet for public areas and function rooms were Axminster and the bedrooms were bespoke Machine Tufted. Email our Estimating & Design Team for further information. and use, and does not contradict anything else connected with the flooring installation such as under floor heating or finish heights for example. Also, as a general rule of thumb we believe it is false economy to fit new carpet over old underlay. Carpets need to have as firm a support as possible in order to achieve its maximum performance. An old underlay may have already become flattened and less resilient to a greater or lesser extent depending on its use, however this does depend on how long the underlay has been fitted and the frequency of use of the area concerned. To help we've put together the list below of the most common situations and scenarios. As always though any advice given must be taken in context of the specific situation and the information in this guide is no guarantee to product wear or successful installation as many different factors can contribute to the end result. Domestic Bedrooms (carpet) For super comfort and softness you should use a thick underlay such as Cloud 9 Cumulus or Dreamwalk (11mm) as this provides a soft and luxurious feel underfoot and is suitable for the ‘stretch fitting’ method. You can also use the more traditional felt underlay (see hotel bedrooms above) although as it is not as aesthetically pleasing as say Cumulus or Dreamwalk and so is used less in domestic installations. The Cloud 9 Range also has two other domestic underlays, Nimbus (7mm) and Cirrus (9mm). Underfloor Heating (carpet/wood)	 There is limited choice here as the combined tog rating for the carpet and the underlay should be no more than a 2.5 tog. A reputable choice for carpet is Heatflow by Tredaire and Timbermate Excel by Duralay for wood/laminate). Sound Reduction	 Noise reduction is measured in terms of dB. The higher the figure, the greater the noise reduction. Acoustic sound insulation figures are based on impact sound and not airborne sound. One of the highest is Cloud 9 Cumulus at 43dB, which is a traditional domestic underlay and is on a par with the much more expensive specialist acoustic underlays. Comfort/Luxury	 See above, Cloud 9 Cumulus by Ball & Young or Dreamwalk by Tredaire. Carpet Tiles	 None required. Some carpet tiles are cushion-backed thereby offering their own layer of ‘underlay’. Foam-backed Carpets	 Underlays are not recommended for use with these types of carpets. 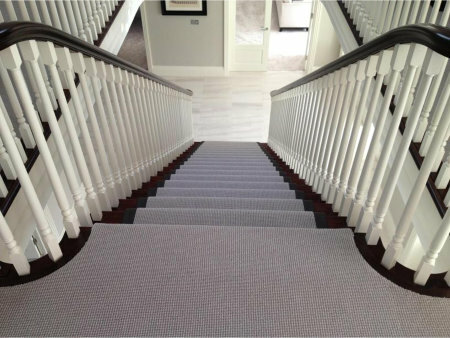 Stairs Carpet laid over stair nosings suffers the heaviest wear (hence in many contract installations a metal stair nosing is used) so flat, firm underlays offer the best protection. Generally speaking the same underlay used elsewhere in the install is used to give continuity of feel. Hotel Bedrooms	 Felt underlay (42oz) is used widely in commercial installations because it is hard wearing and firm whilst providing exceptional support to the carpet. It’s also environmentally friendly as it is made from 100% recycled fibres, and has excellent thermal and acoustic insulation properties. High Traffic Areas e.g. Receptions/Function Rooms/Hotel Corridors	 Crumb rubber such as Durafit 650 is produced in the UK by recycling used car tyres into granulated rubber particles. These are bonded together to create a frim underlay with a high rubber content, offering outstanding durability in high traffic areas. Its density is also ideal for rooms with heavy furniture as it’s highly resistant to indentation marks. Like felt, rubber crumb is also one of the most environmentally friendly underlays with over 80% of the product containing recycled content. The method of installation used is called ‘double stick’ where the underlay or rubber is stuck to the floor and then the carpet is stuck to the underlay. Firmer underlays in these situations will prevent excessive vertical movement and stretching of the carpet in use and will therefore help to prevent rucking problems. Best for Thermal Insulation (for example concrete floors)	 You need an underlay with a high tog rating so Cloud 9 Cumulus (3.1 tog) is a good one and any felt product will have a higher tog rating due to the naturally high wool content of the product. The higher tog rating will provide excellent thermal insulation and prevent the transfer of heat through the underlay. It will also help reduce cold air transferring through the underlay from the concrete floor. For more information on what Gravity can offer you from the complete package service or just individual elements of it including design, manufacture and installation, please explore the website, or give us a call. And please don’t forget, we’d love to hear your feedback, good and bad, on any aspect of our service, so if there is anything at all, don’t hesitate to get in touch via our Newsletter Feedback. Click here to see more of our completed installations.